A 10 Letter Word to Hell. Fledgeling director Johnny Martin (Vengeance: A Love Story) manages to pull in some heavy weight actors for this serial killer crime thriller. Unfortunately that heavy weight made this film sink and sink quickly. It is a quirk on the serial killer movies though, using a child’s game as the premise for the dastardly deeds. Ray Archer (Al Pacino, Righteous Kill, The Devil’s Advocate, Heat, Carlito’s Way) is a retired police detective who spends his time in his car watching the city going by, until a speeding van comes and side swipes his car and then he gives chase. Finally the van is brought to a halt and the perp is arrested by Archer. Christi Davies (Brittany Snow, Pitch Perfect, Bushwick) who is doing an in-depth exposé on the life of modern policemen on duty. It turns out that 025 is the one and only Ray Archer so Will goes to see him in his car. Now the trio of Will, Ray and Christi must find the serial killer named Hangman. The writers try and give Will a back story that ties in with events but it isn’t enough to save this film, as we trudge through the mire to find the Hangman (Joe Anderson, The Ballad of Lefty Brown) who we see brief glimpses of as he flees each crime scene. There are ten letters, how many clues do you need? Definitely one for the Pacino and Urban fans. 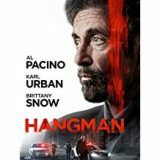 Hangman is available on DVD and VOD.